Today I wanted to tell you about a pretty good deal. 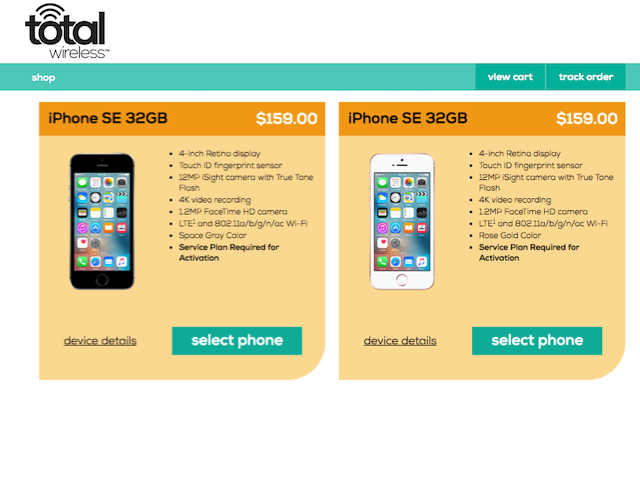 Total Wireless is selling the iPhone SE for $159. That is a good price so I thought I check it out. Use the link below to visit totalwireless.com. BYOP: Monthly Activation Kit Starting at $9.99 at TotalWireless.com! On totalwireless.com, enter your zip code and confirm it to see a list of the phones they sell that will work in your area. If you scroll down, you’ll see the iPhone SE 32 GB for $159. Before going on, this iPhone is for new and existing Total Wireless customers. Do not buy the phone to use it with another wireless service. This iPhone requires a Total Wireless service plan for activation. This is a really nice price for the iPhone SE. If you were to buy the a new SIM-Free unlocked model from Apple it’s $399, so it it much cheaper to buy it from Total Wireless. As far as I can tell, this iPhone SE is new. Its the 32GB storage model, so its the latest version. Apple recently updated the iPhone SE from 16G / 64 GB of storage to 32GB / 128 GB. They have the phone is Space Grey and Rose Gold, the two most popular colors. While the iPhone SE is the same size and shape as the iPhone 5 / 5s, Apple updated the phone. It shares many of the same specs as the iPhone 6S so its a pretty modern phone despite the small screen. In my opinion this is a way better deal that the $100 iPhone 5s they sell. You will need to use this phone with Total Wireless. I have many articles and videos about Total Wireless on smartphonematters.com and the YouTube channel, so check them out. I will say I think total wireless is a really good option for people looking for a low cost prepaid service that uses the Verizon network. 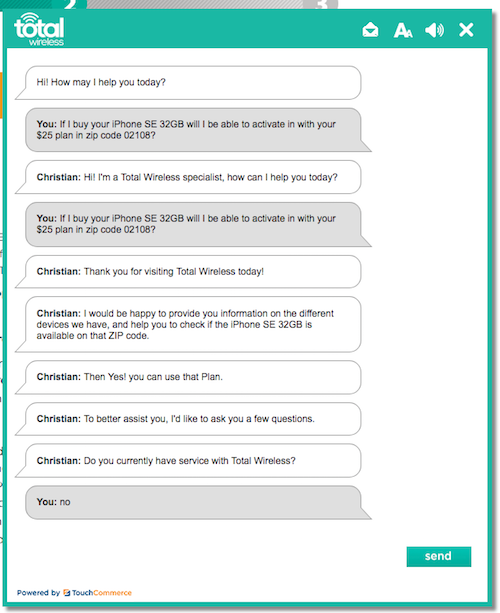 I remember from the last time I looked at Total Wireless they have an unlimited talk and text plan for $25 per month. I asked the customer service rep in live chat and he told me this iPhone SE can be used with that plan. One of the cool features of total wireless is add on data. You can buy 3GB of data for $10. The data does not expire and rolls over while your account is active. I didn’t ask the service rep if the add on data can be used with this plan but several readers and viewers have confirmed in the past that you can add data to the $25 plan. If you want to use this phone with the $25 plan and add on data I recommend you confirm you can with a customer service rep in live chat just to be sure. Finally, I want to point out that between now and June 16th you can save 15% using the offer code total15. This brings the price of the phone down to $136 which is even a better deal.